February, 1988 seems to have been a relatively quiet time, but some noteworthy events took place. It was the month when televangelist Jimmy Swaggart (cousin to musicians Jerry Lee Lewis and Mickey Gilley) confessed his sins (consorting with prostitutes), and Anthony Kennedy joined the Supreme Court, which ruled 8-0 against televangelist Jerry Falwell in an important case upholding First Amendment rights. Guitar-wise, I was playing my new Epiphone Sheraton II, taking lessons with my GIT-trained teacher Jim McCarthy, and continuing to swim in a blend of music, from jazz on radio station WRTI, classic rock on stations WMMR and WYSP, pop and metal on MTV, and blues on a local radio station whose call sign I forget. 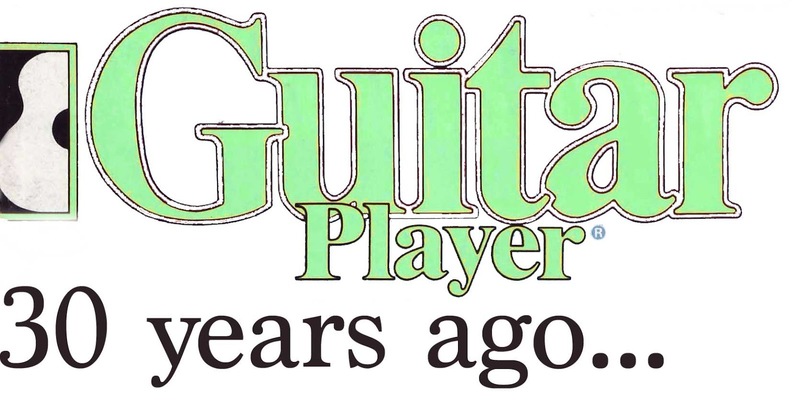 Revisiting the February, 1988 Guitar Player was an interesting experience. It features the wide diversity in genres that I am getting used to seeing, but the focus was largely on artists just breaking through on a national level. In addition to the cover story on Joe Satriani (supposedly his first ever on a national magazine), there was a very interesting triple profile of bluesmen Charlie Baty, Ron Thompson and Anson Funderburgh; features on Yellowjackets bassist Jimmy Haslip, classical legend Christopher Parkening and studio/sideman extraordinaire Kevin Dukes as well as a number of interesting lessons and gear reviews. 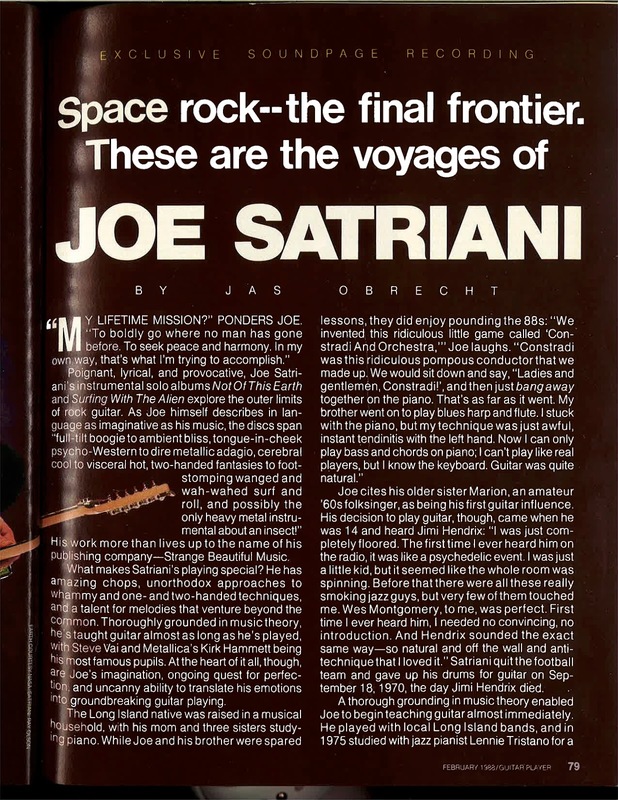 Re-reading it now reminds me how comparatively narrow guitar magazines are now; not just in terms of genre but in terms of the relative fame of the musicians covered. While Satriani’s Surfing with the Alien had just come out and was getting chart success, most of the other musicians featured were far from what one would call “popular”. 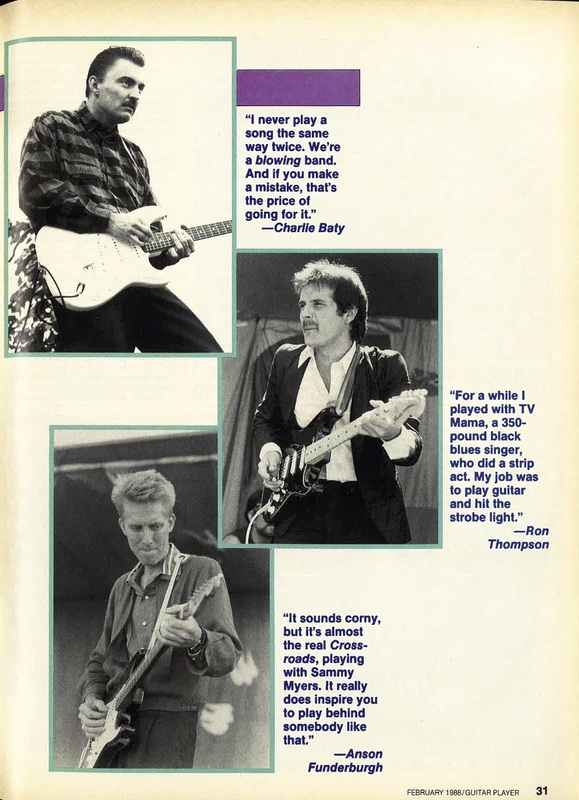 The triple profile of the blues guitarists by editor Dan Forte is an interesting example. 15 pages (out of a very sizable 186) are devoted to three musicians who combined had probably not sold more than 250,000 records. The article purports to introduce “the new breed of young bluesmen”, frontmen of Little Charlie and the Nightcats, Ron Thompson and the Resistors, and Anson Funderburgh and the Rockets. As a teenager I probably would have just focused on “new breed” and “young”, but re-reading the article makes it clear that all three had been working musicians for a long time; Baty says he’s been a professional “for 12 or 13 years”, Thompson had been playing in clubs since his mid-teens, and Funderburgh was a 33 year-old Dallas contemporary of Jimmie and Stevie Ray Vaughan, and had led the Rockets for “almost 10 years”. In November of 2016 I went to a blues concert at Buz and Ned’s, a local BBQ restaurant in Richmond, Virginia featuring harmonica player Mark Hummel backed by Charlie Baty and Anson Funderburgh. It’s both inspiring and humbling that more than 28 years after this article 2/3rds of the subjects were traveling in vans, setting up their own equipment, and roaming the country to play their music before small, appreciative audiences. It was a good show, and after re-reading this article I tip my hat again to real musicians who just HAVE to play. 17-year old me was pretty unaware of the differences in tones between different kinds of guitars, but now that I have so much more experience, this makes so much sense and I understand the “super Strat” phenomenon better. Speaking of gear, check out the Fender Telecaster with Floyd Rose that Jackson Browne strums in the concert video–did he put that on just for tuning? And by the way, Dukes’ playing is terrific. 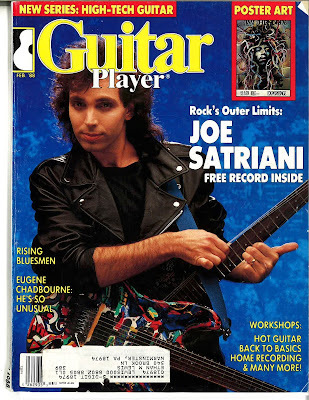 Joe Satriani was the cover star of this issue, in a 16 page article by Jas Obrecht, including a vinyl flexidisc soundpage (with transcription). 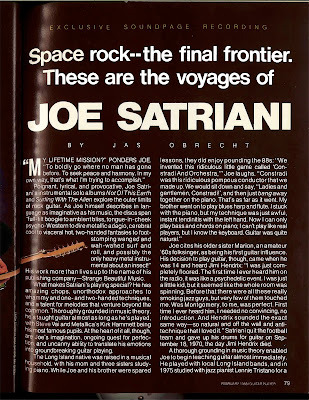 Satriani is, of course, one of the most famous rock guitar instrumentalists, organizer of the G3 tours which have attracted legions of (mostly male) attendees for two decades and the inspiration of numerous signature guitars (Ibanez), amps (Marshall), and effects pedals (Vox). Joe was featured in the February, 2018 Premier Guitar, showing that he has more than maintained his pre-eminence over the last three decades. Q. Does it bother you to see less inventive players achieve broader success than you have? No. I don’t feel competitive with other guitar players. Over the years, I see both success and failure as imposters. They cannot be what you use for your standard operating procedure for how to write music, for how to play. Q. Did timing come naturally, or did you teach yourself? I taught myself. Timing is natural, but you have to practice it and work at it to convince yourself that it’s there. When I was a young kid listening to the Beatles and the Stones, I didn’t say “Boy, he could have played groups of three there!”I wasn’t thinking of that. But once you get exposed to that, you can feel things like groups of five. You’ll like them, and you may use them with discretion and taste. I think I learned a lot from the timing of other people–Hendrix, Stevie Wonder or Larry Graham. I listen back and say “Yeah, they’re late here, and they’re early here, and that creates a sound.” Some people push the beat when they are creating a certain kind of a song, some people drag, some people go right in the pocket. As your sense of time gets better, the idea of the beat becomes this huge circle and you see that you can play with it and use it as a tool to get a song to come off a certain way and evoke a certain emotion, especially with bass. Q. Is there an inherent mood in every key and scale? Not just one. In the hands of an artist, what you can do is almost limitless. I definitely operate on that assumption. I’ve heard so much beautiful music done in major keys, and yet very little of it is in heavy rock, exploratory jazz fusion, or whatever you want to call what we’re doing…. One scale can sound a lot of different ways, and I’ve really tried to work with that on the last two records. With “Always With Me, Always With You“, I tried to use those major scales to be tender and sharp and haunting and a whole bunch of things. Q. Do you imagine a melody before finding it on guitar? Yes. It’s like it comes to me; I hear it being laid out. But I do spend quite a lot of time editing. I edited the hell out of “Always With Me…” because I was intrigued with how beautiful it was. I wanted the song to start with a melody, go into a slight improvisation, give a countermelody, go back to the original melody, do another little improvisation and return to the melody. I wanted to be as cool as the sax player you see in a nice jazz club where there is a bassist, a piano player, and a drummer with brushes. And this guy just stands up with his sax, plays the melody, and the song is over. No big rush, no ego solo, no exploding things. …I had to find that sort of player in me, those sensibilities, and then figure out the technique. Q. You must have had a lot of self-assurance to finance your own album with a credit card. Q. Do you have any special guitar setup tips? I like to use just two springs in the back of the guitar. They are very tight, and they go straight across the outside positions. I routed out just a little bit more wood for the Floyd Rose, just because I like it more flush…My tone control is disconnected. When I pull up on that knob, it engages a bass roll-off; when the knob is down it’s inactive. That’s just the way it’s set up now. We’ve been doing up-to-the-minute modifications on it….I like a neck…like an early ’60’s Stratocaster. I don’t like high frets; I like them quite low so I can apply different kinds of pressure to the strings to get different tone qualities and nuances of intonation. Q. Do you have any suggestions for guitarists who want to explore different styles? Yes. Let’s say you’re a heavy rock player who is wondering about blues or soul. Get a 4-track tape recorder, because we are in the age of recording, and people’s sound is built around their records. Put down a mock soul piece and retain your personality, but try to go with the track and pick out lots of different things…just work on it until you find your own voice in that particular form of music. Q. 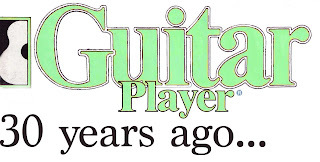 Were you experimenting with fingertapping before Van Halen came along? Sure. Oh there were a lot of people who were. But I’m a huge Van Halen fan. When I first heard their first record, I just loved it. It was great…Eddie put together that little two-handed hammer-on thing in such a great way. It was so gutsy! It wasn’t progressive rock; it was really a go-for-the-throat kind of thing…Eddie must be definitely crazy, and I like that. I enjoyed re-reading this issue, and I hope you found it interesting. The reviews of recent music didn’t have quite so many “big” artists, but there was a short review of Chuck Berry’s autobiography. But more on that next month, when Chuck was on the cover of the March, 1988 issue. Also, I hope you join me in sparing a thought in memory of Tom Wheeler. Wheeler was the editor in chief of Guitar Player, and founder of Bass Player as well as a longtime professor of journalism. He was a major reason for the excellence of the magazine I’ve been trying to share with you, and he’ll be missed. I’ll see you here next month; until then, keep on picking!